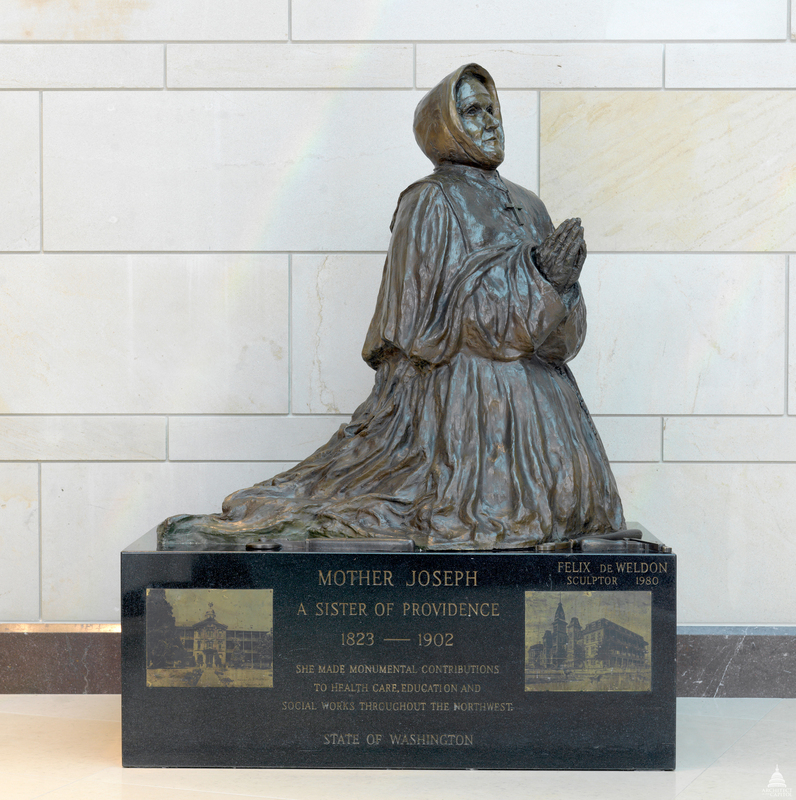 This statue of Mother Joseph was given to the National Statuary Hall Collection by Washington in 1980. On April 16, 1823, Esther Pariseau was born in St. Elzear near Montreal, Canada. At the age of 20, when she entered the Sisters of Charity of Providence in Montreal, her carriage-maker father remarked, "I bring you my daughter, Esther, who wishes to dedicate herself to the religious life. She can read, write, figure accurately, sew, cook, spin and do all manner of housework. She can even do carpentering, handling a hammer and saw as well as her father. She can also plan for others and she succeeds in anything she undertakes. I assure you, Madam, she will make a good superior some day." In 1856, Mother Joseph was chosen to lead a group of five missionaries to the Pacific Northwest Territories of the United States. There she was responsible for the completion of 11 hospitals, seven academies, five Indian schools, and two orphanages throughout an area that today encompasses Washington, northern Oregon, Idaho and Montana. An architect and artist, she was actually responsible for designing the buildings, supervising their construction, and fund raising. Each of her "begging tours" into mining camps lasted several months and raised between $2,000 and $5,000 toward the realization of her goal. A stickler for detail, Mother Joseph often inspected rafters and bounced on planks to ensure their support. Mother Joseph died of a brain tumor in 1902, leaving a legacy of humanitarian service. She is recognized as one of the first architects in the Northwest. Mother Joseph statue on the East Front portico moving into the Rotunda on April 25, 1980. Back Left: Architect of the Capitol George White talks with sculptor Felix de Weldon.